Pregnant with triplets? Don't Panic! So you just found out you're pregnant - with triplets! You were likely just getting used to the idea of being pregnant with one baby, and now you must adjust to the idea of welcoming three little bundles of joy in a few short months. The good news is that you are not alone; the National Center for Health Statistics reports that the number of higher order multiples (triplets, quadruplets, etc.) increased by more than 400% between 1980 and 2000. Luckily, along with this increase in multiple births has come advances in prenatal and neonatal medicine that make it likely that your triplet pregnancy will be successful, and result in the safe arrival of three precious babies. 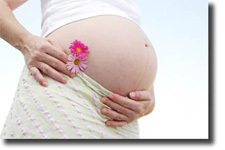 The incidence of pregnancy complications is higher for women who are pregnant with triplets. Because of this increased risk, you can expect to visit your healthcare provider more often than women pregnant with a single baby. By the time you enter your third trimester, you can expect to have prenatal appointments weekly, to ensure that you and your babies remain healthy. Complications that you will be watched for include anemia, gestational diabetes, preeclampsia, and preterm labor. These complications are not unique to triplet pregnancies, but may be more likely to occur than with a singleton pregnancy. You also may find that you experience heightened pregnancy symptoms, such as severe first-trimester nausea (morning sickness) or extreme fatigue. These are normal symptoms of pregnancy, and occur as your body adjusts to its new task of nurturing three growing babies. It's important for you to maintain a high level of nutrition throughout your pregnancy, and especially during the first trimester. A pregnant woman needs an extra 300-500 calories per day for each baby she is carrying, so a woman pregnant with triplets should increase her caloric intake to 3000-4500 calories per day. Your goal is to gain 34 pounds by the time you are 24 weeks pregnant. This can be a challenge if you are experiencing severe morning sickness, but a few tips to help keep your blood sugar level from fluctuating can help: try eating six small, evenly spaced meals and snacks each day; drink plenty of water; and combine proteins and carbohydrates with every meal, especially your bedtime snack. In addition to making healthy food choices, you should take a prenatal vitamin and any other supplements recommended by your doctor, such as iron and zinc. As you enter your third trimester, your doctor may consider putting you on bedrest to help avoid preterm labor. Ninety percent of triplet births are premature, with delivery often occurring around 32-34 weeks gestation. Although a pregnancy is not considered full-term until 37 weeks, babies born earlier still have an excellent chance of survival. There have been so many recent advances in neonatal care that more than ninety percent of premature babies who weigh at least 2 pounds at birth will survive. It may also be comforting to know that you will not be alone in welcoming your babies into the world earlier than expected. While premature birth is common in triplet and other multiple pregnancies, it is a risk with any pregnancy and, in actuality, factors other than multiple pregnancy account for eighty-five percent of all premature births. Although multiple pregnancies do present an increased risk of complications for you and your babies, being pregnant with triplets is no cause for panic; you and your doctor can work together to ensure that you have a successful pregnancy. Pregnancy can be wonderful and exciting, and being aware of what to expect as your pregnancy progresses can help you relax and enjoy the experience. There is so much to look forward to as you await the arrival of your three babies, and many reasons for you to expect a healthy pregnancy and wonderful outcome.